A Google™ search indicates that one of the foremost sites for high end Art Deco furniture at wholesale prices is Gibraltar. 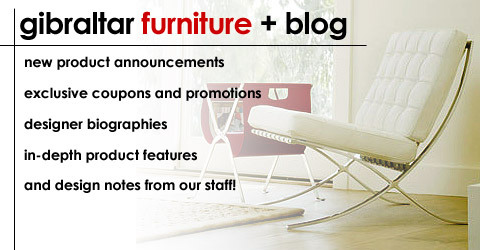 “This West coast Internet pioneer features Bauhaus, retro, modern, and post-modern furnishings at rock bottom prices. Gibraltar offers an exceptional array of wholesale, architectural, modern, high quality items at factory direct discount prices. Gibraltar Furniture is one of the leaders in the world of Internet modern architectural products. Gibraltar sells furniture manufactured in Italy, Asia, and the USA and all sales are tax free outside of California.” This Beverly Hills 90210 store has been in business for over 50 years! Art Deco was a popular international design movement from 1925 until 1939, affecting the decorative arts such as architecture, interior design, and industrial design, as well as the visual arts such as fashion, painting, the graphic arts and film. This movement was, in a sense, an amalgam of many different styles and movements of the early 20th century, including Neoclassical, Constructivism, Cubism, Modernism, Bauhaus, Art Nouveau, and Futurism. Its popularity peaked in Europe during the Roaring Twenties and continued strongly in the United States through the 1930s. Although many design movements have political or philosophical roots or intentions, Art Deco was purely decorative. At the time, this style was seen as elegant, functional, and modern. Q: ARE YOUR CLASSIC PRODUCTS COPIES OR ORIGNIALS? We sell many items that are fully licensed products from the official sources. Instead Gibraltar offers both authentic and also high quality reproductions, at factory direct prices on all these pieces! Many of these items are “reproductions” of old designs. Our design experts have exactly copied each and every detail and faithfully executed all of the scale, aspects, and lines of these masterpieces. Careful attention has been given to maintaining the same look, feel, and style of the Bauhaus icons that define modernism. You will be getting a perfectly made modern art piece, crafted in the European tradition, at a price you can’t beat! We use overseas factories to achieve these results. We use due diligence to insure that all the right tools are used in this process. Despite the designers’ intention to create furniture which can easily be produced mechanically, the creation of modern classics requires considerable skilled hand labor and a wide variety of different production steps. We employ only perfect manufacturing methods in order to bend tubes and to make upholstery that keeps its shape for decades. The results are master pieces that ring true to the originals. Our overseas factories use optimum methods to reproduce these beautiful Bauhaus and Modern Classics Furniture in a way so you can enjoy them year after year. To illustrate, we offer the Barcelona series at our store. Mies van der Rohe designed the Lounge Chair and Ottoman for the German Pavilion at the International Exhibition of 1929 in Barcelona, Spain. The “X”-shaped Mies Lounge Chair and Ottoman features sleek minimalist line styling which produces a perfect blend of art and function. Gibraltar’s Mies Lounge Chair and Ottoman is made of heavy gauge solid stainless steel seamlessly welded and polished to a high luster, It features comfortable high density fire-retardant polyurethane foam wrapped in Dacron, enclosed in ticking, and encased in fine imported 100% Italian leather. Many of the classics have undergone some construction changes since they were designed in the 20’s and 30’s. Today’s materials and tools allow for construction as crisp as the designers envisioned, but could not necessarily achieve due to the state of yesterdays technology. Many problems have occurred in older pieces when metal fatigue has resulted in damaged frames which can no longer be used. Our modern construction technique produces a metal frame with greater strength in its joints. This means your furniture, will be sturdier than the originals. Our reproductions are very high quality new items designed for daily use. They are not numbered or stamped to justify the tripling of prices. If you purchase an item like this, you are actually paying for a license fee that is no longer required. The manufacture of such pieces is charging you a premium for a royalty that once went to a designer. Now that these designs have been paced into the public domain a patent payment is unnecessary. However, instead of lowering the price points on these editions the fabricators are happy to hold onto your money and pocket the difference. They will not lower their price levels to reflect this change to not offend their previous customers. Instead they are happy to charge thousands of dollars more for the same items that we sell for a fraction of the price. Our entire pieces feature high quality imported premium heavy gauge steel. Ultra-Premium #304 Solid flat bar stock Stainless Steel pieces are used in each of our units. These are then hand polished to a super brilliant chrome style finish. Our frames are NOT made using lower cost carbon steel, which may be chrome-plated hollow tubes and then bolted/screwed together. Over the years this chrome will start to peel and corrode leaving you with an ugly unit. All of our reproductions are made using 100% imported Italian leather. Multiple colors and grades of premium top grain Italian leather are available for your design requirements. We sources our hides from the same supplier that provides leather for Mercedes Benz and BMW automobiles Every square of leather is hand selected, piped, tufted and individually sewn by expert leather craftsmen Each piece is true to form, comfortable, and feature a luxurious cushion system. Naturally there is a range in quality of the reproductions on the market. Be assured Gibraltar are tops in quality in every possible way! Today classic furniture is produced by many different manufacturers, some with great care and attention to details, others with less care. Many lower cost releases will compromise quality by using vinyl, pig leather, or low cost Chinese inferior hides. Copy or original? We call the items what they truly are: “reproductions” of old design, no matter who produces them today. Our items do live up to all modern expectations on appearance and durability, even under intense scrutiny. They are all New Reproductions of Modern Classics at a price that can’t be beat! Q: WHERE ARE YOUR REPRODUCTIONS MADE? A: We sell these products from two main sources. 1. Italian leather, Italian stainless Steel, European construction. We source these models from Italy viaGordon International. We use 100% Italian Leather and 100% stainless steel frames. As Italian labor is more costly than non -European overseas sources the cost corresponding goes up. Please visit http://www.gordoninternational.com for pricing info. It takes 15-20 hours to pay these chairs. Labor in Europe is about $30 per hour. This makes the total cost higher. However, we mark down all of these models and the price that you will pay will be 30% off of the list price. We deep discount all of these models as we are a factory direct internet wholesaler. 2. Italian leather, Italian stainless Steel, Non-European construction. We source these models from our own overseas factory. We use 100% Italian leather and 100% stainless steel frames. As overseas labor is less expensive than European workmen the total price goes down accordingly. It takes 15-20 hours to pay these chairs. Non-European labor is about $3 per hour. This makes the total cost lower. We deep discount all of these models as we are a factory direct internet wholesaler. The quality is virtually the same, the materials are the same, and the end product is the same. Therefore the choice is yours. 800 416 3635-Gibraltar Furniture is a secret weapon website for high end furniture at wholesale prices. We ship manufacature direct so that you don’t have to pay a middle man for a mark up. This means you get factory direct warehouse units, great product, and unbeatable prices. Q: WHAT IS THE DIFFERENCE BETWEEN YOU AND DWR? A: Our products are similar in design, construction, scale, and materials used in the higher priced DWR versions. The main difference between us and DWR is that they charge full list price for everything that they offer. Conversely, we deep discount all of our products. Therefore the major difference is the amount of money that you will be saving by selecting our items vs. the DWR editions. Plus on our classic chrome items we offer a complimentary upgrade on our frames that DWR will charge you an arm and leg for. For instance, on the Knoll Barcelona releases DWR offers the standard frame model. This means that you will be getting black pig iron that is dipped in chrome. Both Cassina and Knoll offer an upgraded stainless steel version. However the up charge for such will be significantly more. We think our customers deserve a higher grade of product than this. Therefore we require our factories to use stainless steel frames that are buffed to a highly polished finish instead. For instance we use imported, heavy gage, all stainless steel, highly polished 12 MM frames on all of our Barcelona pieces. This costs us far more, but the result is well worth this extra effort. The end product lasts a lifetime and is very durable. In comparison DWR regular chrome plated products will start to shed and peel over the years. Plus oxidation will occur on a chrome piece whereas highly polished stainless steel is impervious to rust, oxidation, and metal corrosion. In addition we only use 100% imported Italian leather for each and every product we manufacture. This premium full leather material is the finest that money can buy! With DWR, Herman Miller, and Knoll you are also paying extra for the use of licensed products. This adds greatly to the price of each piece. Many of the designs that DWR, Herman Miller and Knoll sell are now in the public domain for classic Bauhaus models. In the past manufactures had to pay an extra fee for the use of these designs and the artist was paid a fee for each product that was produced. However most of these products no longer require such. But companies such as Knoll and Herman Miller did not lower their prices to reflect this change. Instead they just pocket the sum they once paid to the architect. Rather than decreasing the prices to reflect the lower production costs for these items the manufactures have decided to raise them. The only ones that are being fooled by this is the un-informed public. DWR prices are costlier than ours in that you have to pay for all of their stores, advertising, marketing, and promotional costs. Also DWR charges taxes in all the states that they have stores in. We use the direct to the consumer model instead. Consequently you will be getting the factory direct, wholesale price, instead of the top dollar retail price that DWR offers. Q: HOW DO YOUR REPRODUCTIONS COMPARE TO HERMAN MILLER AND KNOLL PRODUCTS? A: We sell both factory authorized originals and reproductions at a lower price point. Either way you will end up saving money when you purchase from us as we are an internet deep discounter. Many people ask us if our products are re-productions or Herman Miller or Knoll originals. Herman Miller, Knoll, and Gibraltar Furniture all sell re-production pieces as the originals are very valuable art pieces and reside in museums or private collections. Plus if you purchased an original edition you may not want to use such for every day use as this would be very risky practice. Therefore Herman Miller, Knoll, and Gibraltar Furniture all sell reproductions of the original design. Herman Miller and Knoll charge you more for this privilege. Gibraltar feels that the wise customer wants value, design, and purity. Therefore we charge you less for the same piece! Many of our pieces are 100% accurate reproductions of the Knoll and Herman Miller classics. We have faithfully duplicated all of the design elements including the original dimensions, style, form, and exact materials at a fraction of the price. For instance, all of our cushions are a perfect combination of seating softness, comfort, and linearity which insures crisp design lines. No short cuts are taken and the leather sources we use are the best in the world! We use the Internet as our showroom in that we are a factory direct wholesale source. In a word we a comparable to Amazon.com re: our factory direct pricing. However your purchase is risk free. We offer a hassle free, no questions asked, 7 day return policy. Your purchase is also fully guaranteed by both Lloyds of London and the Yahoo buyer’s protection plan. $1295 is the price for Pony hide Le Corbusier LC4 chaise at www.gibraltarfurniture.com ( 800 416 3635). The Chaise Lounge is one of the most famous furniture designs by Le Corbusier, and is the only one on which he worked personally. He called it the “rest machine”. This multi-position chaise lounge is the ultimate relaxation machine! A Google™ search indicates that one of the foremost sites for high end furniture at wholesale prices is Gibraltar. “This West coast Internet pioneer features retro, modern, and post-modern furnishings at rock bottom prices. Gibraltar offers an exceptional array of wholesale, architectural, modern, high quality items at factory direct discount prices. Gibraltar Furniture is one of the leaders in the world of Internet modern architectural products. Gibraltar sells furniture manufactured in Italy, Asia, and the USA and all sales are tax free outside of California.”This Beverly Hills 90210 store has been in business for over 50 years! DWR offers the same piece for $3,210.00. The main difference is that the official Cassina release comes with a certificate of authenticity and our reproduction does not. This edition is a world class imported product that will be a showcase addition to any collection! We can produce this chaise in Black, Bright White, Camel, Chocolate, Ivory, Black, Red, Saddle Tan. Bordeaux, Cognac, Cappuccino, Golden Tan, Hunter Green, Navy Blue, Parchment, Tangerine, Wasabi, Cranberry, Toffee, or Whiskey in your choice of three different leather grades including Deluxe, Primo, and Exquisite. Frame: Stainless steel frame, polished to mirror shine. Unlike competitors’ chrome plated version, our solid steel frame will not rust nor chip. Unlike inferior, lower quality versions with open joints and exposed screws, all joints are fully welded, sealed and sanded. Our cushion construction features a custom system. Cushions are made of multi-density foam, layered for the highest plush comfort and support. Manufacturers Warranty of 1 Year against defects or workmanship errors. This is a classic masterpiece made out of 100% Italian leather. Our Le Corbusier LC4 is a modern masterpiece. The cushions are made of multi-density foam for plush comfort and firm support. The leather is hand-selected, expertly sewn and piped. The lines are clean, straight and precise. Incredible quality, style and comfort at an unbelievable price. The sofa and loveseat are available, too.